Local volcanologists reported that there was increased seismicity at Tenerife in mid-May, according to a news article. The article stated that during several days before 18 May there were "five successive low-intensity earthquakes in the island's most volcanically active zone in the area between Mont Teide and Santiago del Teide." The director of the Estación Vulcanológica de Canarias stated that the earthquakes, which were less than M 2, could be an early sign that something unusual was happening at the volcano. References. 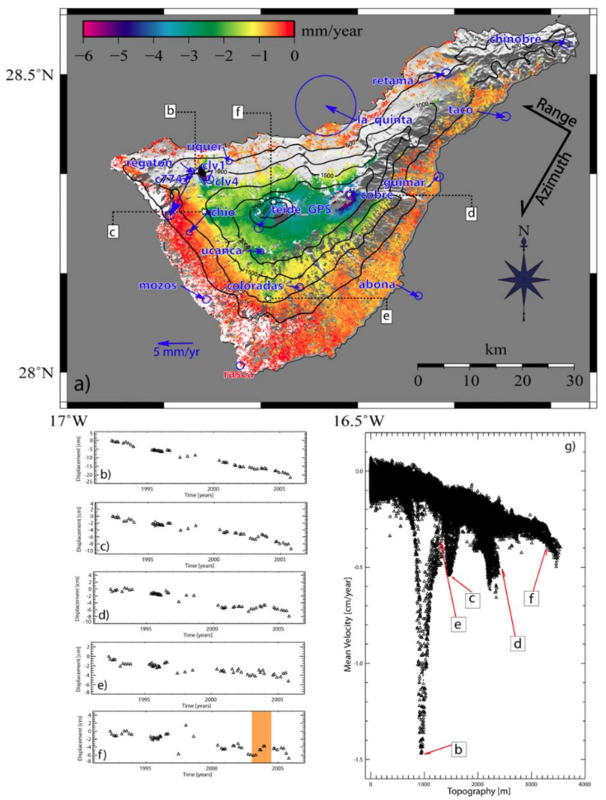 Garcia, A., Vila, J., Ortiz, R., Macia, R., Sleeman, R., Marrero, J.M., Sanchez, N., Tarraga, M., Correig, A.M., 2006, Monitoring the reawakening of Canary Islands' Teide Volcano: EOS Transactions, American Geophysical Union, v. 87, no. 6, p. 61, 65. Information Contacts: Juan Carlos Carracedo, Estación Volcanológica de Canarias, Consejo Superior de Investigaciones Científicas (CSIC, Spanish National Research Council), Serrano, 117 28006, Madrid, Spain; Josep Vila, Departament d'Astronomia i Meteorologia, Universitat de Barcelona and Laboratori d'Estudis Geofísics "Eduard Fontserè," Institut d'Estudis Catalans, Barcelona, Spain. The large triangular island of Tenerife is composed of a complex of overlapping Miocene-to-Quaternary stratovolcanoes that have remained active into historical time. The NE-trending Cordillera Dorsal volcanic massif joins the Las Cañadas volcano on the SW side of Tenerife with older volcanoes, creating the largest volcanic complex of the Canary Islands. Controversy surrounds the formation of the dramatic 10 x 17 km Las Cañadas caldera, which is partially filled by Teide stratovolcano, the highest peak in the Atlantic Ocean. The origin of the caldera has been variably considered to be due to collapse following multiple major explosive eruptions or as a result of a massive landslide (in a manner similar to the earlier formation of the massive La Orotava and Guimar valleys), or a combination of the two processes. 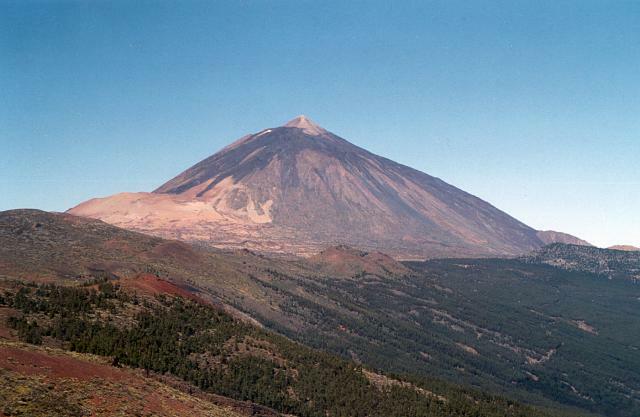 The most recent stage of activity beginning in the late Pleistocene included the construction of the Pico Viejo and Teide edifices. Tenerife was perhaps observed in eruption by Christopher Columbus, and several flank vents on the Canary Island's most active volcano have been active during historical time. This volcano is located within the Teide National Park, a UNESCO World Heritage property. Ablay G J, Ernst G G J, Marti J, Sparks R S J, 1995. The ~2 ka subplinian eruption of Montana Blanca, Tenerife. Bull Volcanol, 57: 337-355. Ablay G J, Marti J, 2000. Stratigraphy, structure, and volcanic evolution of the Pico Teide-Pico Viejo formation, Tenerife, Canary Islands. J. Volcanol. Geotherm. Res., 103: 175-208. Ablay G, Hurlimann M, 2000. Evolution of the north flank of Tenerife by recurrent giant landslides. J. Volcanol. Geotherm. Res., 103: 135-159. Ancochea E, Fuster J M, Ibarrola E, Cendrero A, Coello J, Hernan F, Cantagrel J M, Jamond C, 1990. Volcanic evolution of the island of Tenerife (Canary Islands) in the light of new K-Ar data. J. Volcanol. Geotherm. Res., 44: 231-249. Ancochea E, Huertas M J, Cantagrel J M, Coello J, Fuster J M, Arnaud N, Ibarrola E, 1999. Evolution of the Canadas edifice and its implications for the origin of the Canadas caldera (Tenerife, Canary Islands). J. Volcanol. Geotherm. Res., 88: 177-199. Brown R J, Barry T L, Branney M J, Pringle M S, Bryan S E, 2003. The Quaternary pyroclastic succession of southeast Tenerife, Canary Islands: explosive eruptions, related caldera subsidence, and sector collapse. Geol Mag, 140: 265-288. Brown R J, Branney M J, 2004. Event-stratigraphy of a caldera-forming ignimbrite eruption on Tenerife: the 273 ka Poris Formation. Bull Volcanol, 66: 392-416. Bryan S E, 2006. Petrology and geochemistry of the Quaternary caldera-forming, phonolitic Granadilla eruption, Tenerife (Canary Islands). J Petr, 47: 1557-1589. Bryan S E, Cas R A F, Marti J, 2000. The 0.57 Ma plinian eruption of the Granadilla Member, Tenerife (Canary Islands): an example of the complexity in eruption dynamics and evolution. J. Volcanol. Geotherm. Res., 103: 209-238. Carracedo J C, 2006. El Volcan Teide, Volcanologia, Interpretacion de Paisajes e Itinerarios Comentados. CajaCanarias, 431 p.
Carracedo J C, Paterne M, Guillou H, Perez Torrado F J, Paris R, Rodriguex BAdiola E, Hansen A, 2003. Dataciones radiometreicas (14C y K/Ar) del Teide y el rift noroeste, Tenerife, Islas Canarias. Estudios Geol Museo Nac Ciencias Nat, 59: 15-29. Carracedo J C, Rodriguez Badiola E, Guillou H, Paterne M, Scaillet S, Perez Torrado F J, Paris R, Fra-Paleo U, Hansen A, 2007. Eruptive and structural history of Teide volcano and rift zones of Tenerife, Canary Islands. Geol Soc Amer Bull, 119: 1027-1051. Carracedo J C, Singer B, Jicha B, Perez Torrado F J, Guillou H, Badiola E R, Paris R, 2010. Pre-Holocene age of Humboldt's 1430 eruption of the Orotava Valley, Tenerife, Canary Islands. Geol Today, 26: 101-104. Cas R, Edgar C J, Pittari A, Middleton J, Wolff J, Marti J, Olin P, Nichols H, 2005. Using the stratigraphic record to understand the nature of caldera collapse: the 1.59-present Las Canadas caldera complex, Tenerife, Spain. Workshop Caldera Volcanism: Analysis, Modelling and Response, Parador de las Canadas, 16-22 October, 2005, Abs, p 7-8. Coppo N, Schnegg P-A, Heise W, Falco P, Costa R, 2008. Multiple caldera collapses from the shallow electrical resistivity signature of the Las Canadas caldera, Tenerife, Canary Islands. J. Volcanol. Geotherm. Res., 170: 153-166.
del Potro R, Pinkerton H, Hurlimann M, 2009. An analysis of the morphological, geological and structural features of Teide stratovolcano, Tenerife. J. Volcanol. Geotherm. Res., 181: 89-105. Edgar C J, Wolff J A, Nichols H J, Cas R A F, Marti J, 2002. A complex Quaternary ignimbrite-forming phonolitic eruption: the Poris Member of the Diego Hernandez Formation (Tenerife, Canary Islands). J. Volcanol. Geotherm. Res., 118: 99-130. Edgar C J, Wolff J A, Olin P H, Nichols H J, Pittari A, Cas R A F, Reiners P W, Spell T L, Marti J, 2007. The late Quaternary Diego Hernandez Formation, Tenerife: volcanology of a complex cycle of voluminous explosive phonolitic eruptions. J. Volcanol. Geotherm. Res., 160: 59-85. Fuster J M, Arana V, Brandle J L, Navarro M, Alonso U, Aparicio A, 1968. Geologia y Volcanologia de las Islas Canarias - Tenerife. Madrid: Inst "Lucas Mallada", 218 p.
Huertas M J, Arnaud N O, Ancochea E, Cantagrel J M, Fuster J M, 2002. 40Ar/39Ar stratigraphy of pyroclastic units from the Canadas edifice (Tenerife, Canary Islands) and their bearing on the structural evolution. J. Volcanol. Geotherm. Res., 115: 351-365. Marti J, Gundmundsson A, 2000. The Las Canadas caldera (Tenerife, Canary Islands): an overlapping collapse caldera generated by magma-chamber migration. J. Volcanol. Geotherm. Res., 103: 161-173. Marti J, Mitjavila J, Arana V, 1994. Stratigraphy, structure and geochronology of the Las Canadas caldera (Tenerife, Canary Islands). Geol Mag, 131: 715-727. Pittari A, Cas R A F, Marti J, 2005. The occurrence and origin of prominent massive, pumice-rich ignimbrite lobes within the Late Pleistocene Abrigo Ignimbrite, Tenerife, Canary Islands. J. Volcanol. Geotherm. Res., 139: 271-293. Ridley W I, 1971. The field relations of the Canadas volcanoes, Tenerife, Canary Islands. Bull Volcanol, 35: 318-334. Soriano C, Galindo I, Marti J, Wolff J, 2006. Conduit-vent structures and related proximal deposits in the Las Canadas caldera, Tenerife, Canary Islands. Bull Volcanol, 69: 217-231. Watts A B, Masson D G, 2001. New sonar evidence for recent catastrophic collapses of the north flank of Tenerife, Canary Islands. Bull Volcanol, 63: 8-19. Remarks: Garachico deformation located in the lava flows of the Montana Negra volcano. Subsidence possibly caused by water extraction from water table. 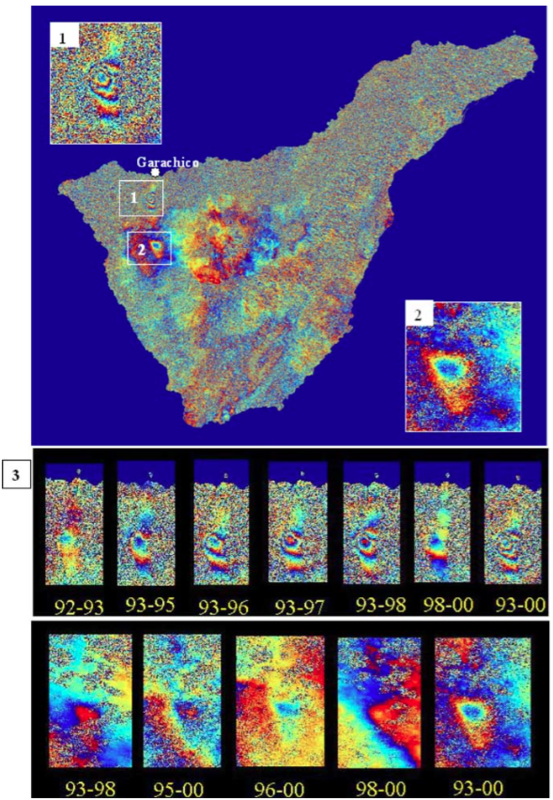 Differential interferogram of Tenerife, processed with 1993 July 20 and 2000 September 15 images: panel1, Garachicodeformation (three fringes); panel 2, Ch ? ?o deformation (one fringe); panel 3, cuttings/clippings of several differential interferograms of Tenerife, showing how the subsidence evolves in time. Above, Garachico deformation; below, Ch ? ?o deformation. From: Fernandez et al. 2005. Reference List: Fernandez et al. 2003; Fernandez et al. 2005. Fernandez J, Romero R, Carrasco D, Tiampo K F, Rodríguez-Velasco G, Aparicio A, Arana V, Gonzalez-Matesanz F J, 2005. Detection of displacements on Tenerife Island, Canaries, using radar interferometry. Geophysical Journal International, 160(1): 33-45. Fernandez J, Yu T-T, Rodriguez-Velasco G, Gonzalez-Matesanz J, Romero R, Rodriguez G, Quiros R, Dalda A, Aparicio A, Blanco M J, 2003. New geodetic monitoring system in the volcanic island of Tenerife, Canaries, Spain. Combination of InSAR and GPS techniques. J. Volcanol. Geotherm. Res., 124: 241-253. Remarks: Chio deformation located south of Garachico deformation in an area covered by basaltic material. Subsidence possibly caused by water extraction from water table. SBAS-DInSAR results. (a) Geocoded mean deformation rate map computed in correspondence to coherent pixels only, and superimposed on the DEM of the island; the reported SAR azimuth and range directions (black arrows) are indicative. Blue arrows show the horizontal displacement measured with error ellipses determined using GPS observations between 2000 and 2006 at the stations of the GPS network. The white stars, labeled as ??b? ?, ??c? ?, ??d? ?, ??e?? and ??f? ?, identify the pixels whose DInSAR LOS deformation time series are shown in panels (b?f); note that in Figure 2f the deformation associated to the 2004 seismic crisis has been highlighted in orange. (g) Plot of the mean deformation rate values (for the pixels located in coherent areas) versus topography with the locations of the areas (black letters from ??b?? to ??f??) affected by localized deformation. From: Fernandez et al. 2009. Reference List: Fernandez et al. 2009. There is no Emissions History data available for Tenerife. Teide volcano, the highest point on the island of Tenerife, towers above the scarp of the massive 600,000-year-old Orotava landslide. The light-colored area on the eastern foot of the volcano is covered by plinian tephra deposits from the Mount Blanca eruption about 2000 years ago. Tiede was constructed within the dramatic 10 x 17 km wide Las Cañadas caldera on the SW side of Tenerife. The large triangular island is composed of a complex of overlapping stratovolcanoes that have remained active into historical time. Photo by Alexander Belousov (Institute of Volcanology, Kliuchi). The Global Volcanism Program has no maps available for Tenerife. IRIS seismic stations/networks Incorporated Research Institutions for Seismology (IRIS) Data Services map showing the location of seismic stations from all available networks (permanent or temporary) within a radius of 0.18° (about 20 km at mid-latitudes) from the given location of Tenerife. Users can customize a variety of filters and options in the left panel. Note that if there are no stations are known the map will default to show the entire world with a "No data matched request" error notice. Large Eruptions of Tenerife Information about large Quaternary eruptions (VEI >= 4) is cataloged in the Large Magnitude Explosive Volcanic Eruptions (LaMEVE) database of the Volcano Global Risk Identification and Analysis Project (VOGRIPA).